Engelenbak was a project conceived by my dad who was a boater at heart. Dad found a well-used and hard-worked boat that was his idea of a “boat project”. 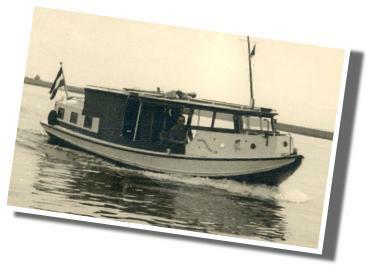 Stout and sturdy, he bought this boat in 1959 to create a floating vacation home that could be moved around from lake to lake in the province of Friesland in Norther n Holland. When you looked at this floating “thing,” it looked more like a floating wooden shoe than a boat … but like I said, dad had a project in mind. The boat was about 35 feet long, made from solid steel, and had a diesel engine that dated back to the 1920s – a real museum piece, but it had a heart. The boat was originally designed to be a floating grocery store, known as a "parlevinker" in Holland. Women aboard barges travelling up and down the Waal River would buy food to feed their families and crew from parlevinkers. With a fast running river and a busy schedule, this little vessel was built to handle all seas and take the abuse of being smacked into the steel barges it would pull up to. Unfortunately know one in the family remembers the original name of this stout little ship. But boy, was it ugly … and my dad considered it a perfect project! As a kid I was put to work scrapping rust off this old “clunker” and smothering tar (bottom paint) all over her bottom … as a reward for doing a good job. After many weekends working away, the topsides were cut open and a new roof was put on. As it turned out, the new roof became the dance floor for my sisters. Dad was not a mechanical guy, the engine was never touched, and the bilge still smelled of diesel and oil. But eventually the boat looked more like a home than a floating grocery store. A painter was put to work and this little tub was painted in pretty white, red and blue colors. 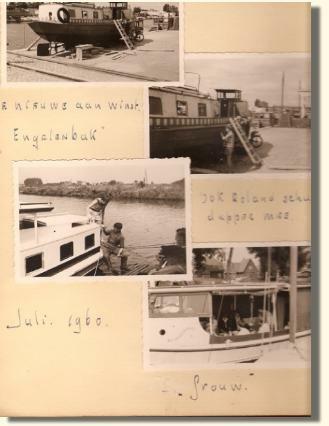 When the boat was re-launched by dad, the name Engelenbak was painted on the bow. So what does the name really mean, you would ask??? The Engelenbak name lives on through seven boats. Roland scrapping paint on his Dad's project ... the original Engelenbak. What does the name Engelenbak mean? Dancing on the roof ... party central.